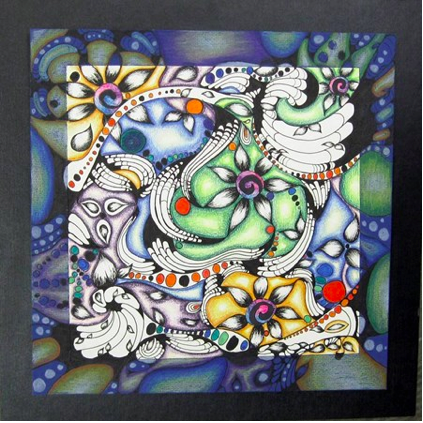 The basic concepts of Zentangling will be used on this project. The final design will be created on two pieces of paper. The center will be a white square and a larger piece of black paper will be glued underneath. The design will start in the center and continue to the black paper. You may start by making a prototype on a newsprint and transferring the design to the final paper. You can also choose to skip this step and draw directly on the final papers. Lightly sketch out your design on the paper. To draw on the black paper, use a white colored pencil. Next outline everything on the white paper with a black sharpie. Leave a thin line of black paper in-between the shapes to act as an outline. You will choose some areas to fill in the black (or leave some black paper uncolored). Other areas will be colored in with colored pencil. The black paper will be colored in with construction paper colored pencils. Notice that the color in the sample is darker on the edges and fades to white in the center. This will help give it a 3-D look.